Why have some Christians, such as Dietrich Bonhoeffer and Martin Luther King, been able to speak truth to power at great personal cost, while others readily capitulate to injustice? In this magnum opus, Christian ethicist Glen Stassen argues that such robust Christianity stems from believing in a "thicker" Jesus, who is Lord over the whole of life and not just one part of it. 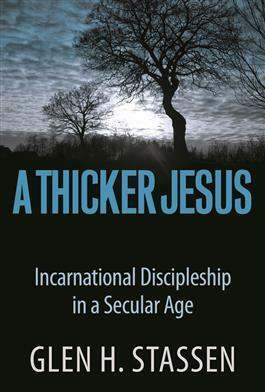 Belief in this thicker Jesus results in "incarnational discipleship" and can help Christians deal with seven challenges raised by what Charles Taylor has identified as a secular age. Stassen elegantly weaves the characteristics of incarnational discipleship as correctives to secularism, which is a complex phenomenon that deserves a sophisticated and rigorous response. Paying particular attention to the Sermon on the Mount, he finds solid ground for Christian faith and Christian ethics in a realist understanding of Jesus that works to give guidance across the board in tough challenges of our secular age.